Happy Thanksgiving! Plymouth scene of first Thanksgiving? Guess again. “To commemorate the arrival of the first pilgrims to Americas shores, a June date would be far more appropriate, accompanied perhaps by coq au vin and a nice Bordeaux. After all, the first European arrivals seeking religious freedom in the New World were French. And they beat their English counterparts by 50 years. That French settlers bested the Mayflower Pilgrims may surprise Americans raised on our foundational myth, but the record is clear. I won’t tell you what comes next; it might spoil your appetite for turkey and stuffing. However the message, I believe, is clear. We can’t always believe what history tells us or believe history when it doesn’t tell us. Two days ago on a gray, chilly San Diego morning – yes they do come that way – I see a bright and shiny jewel. It’s the Elixir Expresso Bar on C street buried among Bail Bonds and Checks Cashed signs. Ah, I follow the heady scent of dark, strong coffee inside. With the coffee I order a fat flaky almond croissant. Carrying my treasures carefully I head for black wooden chairs lined up on other side. The first sip? I’m floating!! Am I in the right century I wonder as I notice the black and white tiled floor and the tiny black metal elevator cage. 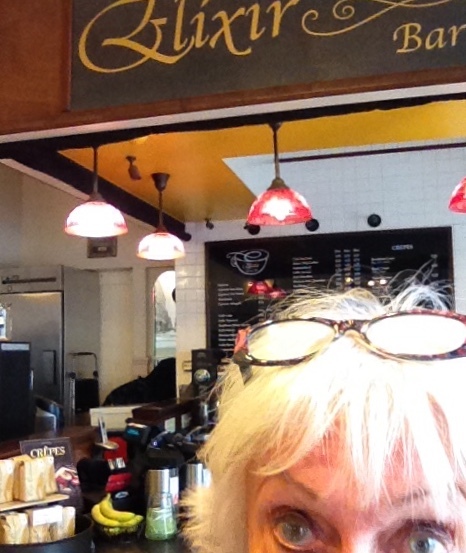 When asked, the barista tells me we’re in the old Marston Store, a famous downtown 1800’s shopping attraction. More sleuthing reveals there was a Branch Library for women in a small room upstairs especially stocked with the latest Women’s Magazines. The three-block walk to the nearby library deemed too long for these dainty women. Whish, I’m in a time-travel blur as Elixir’s trendy shiny metals and red lamp shades morph into ruffled gloved-hands upstairs leisurely turning pages of the Ladies Home Journal. Why not? Time’s not real anyway, Albert E. tells us. This morning I’m experiencing thresholds, not just writing about the word. Yesterday, on the way to empty the trash, my mind was way OPEN. 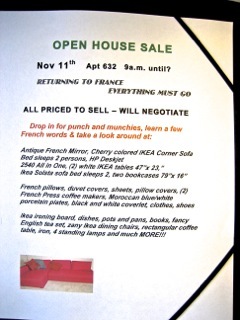 Into this OPEN mind darted the idea – Organize an Open House Moving Sale in my building on Veteran’s Day. Fine, I’m living in a large complex with a variety of different people so this is a great idea. Last night buying food for the event, my stomach began sending queasy vibes. I’d been getting weird late night responses from some potential craigslist buyers. Suddenly I’m concerned. Opening the door to just anyone who would step over the threshold into my apartment? Now, of course, you know I’m the fearless couch surfer, friend of all, tolerance personified. Why was this idea coming to me? When I dare move forward, my inner voices of doom lie lurking at the threshold. Their aim is to prevent me from stepping over that threshold to reach my goal. The choice is mine, step over that symbolic line and find happiness? Or be stopped and feel defeat. At 6:30 a.m. I type the list above of “things” to go. I’m stepping over the threshold today. Knowing I can act as my own antagonist frees me. UPDATE for SENIORS’ Triumph at U.S. Airport Security. This dialogue from two years ago’s on my mind today since next week I’ll be at Los Angeles’ Airport Security. Hopefully this triumph for seniors will still be in place, if it isn’t I’ll let you know. Yes, the passionate nomad’s on the move again. I’m bound for Geneva, Switzerland to rejoin my writing community in order to finish writing my Opus Couch to Couch: Transforming Travels on the French Huguenot Trail. These two years since my last blog represent growth and maturity for me. The passing of my daughter Ann last August and the courageous battle she and her husband Marc waged with her cancer have effected me deeply. After my numbness subsided, I asked myself where am I lacking in integrity and courage? The answers I’ve found will hopefully produce a stronger book, one written with more compassion and love. Next week I’ll be closing the door of this lovely San Diego apartment for the last time. I’ll step over a threshold, that marker between inside and outside, with a clear intention – Ending one chapter and Begining another Chapter, one unknown and full of possibilities. Stay tuned, fellow bloggers, your support most welcome. “But I am over 75,” I say. These words shouted by a security woman at L.A. airport two years ago are coming back to me. They’re on my “screen” now since I’ll be at LA airport in two weeks. Yes, I’m off again this time back to Geneva and my writing community to finish my book Couch to Couch: Transforming Travels On the French Huguenot Trail. The book’s full of amazing stories, some that almost scare me. The Huguenots aren’t dull or dry. Some of the originals hike out to far away spots around the globe and I’m right there with them. No, I’m not hovered over computers scanning the internet; I’m there reading letters they wrote, describing the sights and smells they experienced to bring you their real stories. Pioneering whistle blowers, like the Huguenots, deserve our attention. They’re my favorite Risk-Takers. The two year gap from my last post represents a period of seasoning and maturing. The death a year ago of my older daughter Ann and the courage she and her husband Marc showed during Ann’s two- year battle with cancer strongly effected me. After my numbness subsided, I looked at my life to see where I lacked courage and integrity. The answers I’m finding will hopefully “write” a book filled with more compassion and love. The gap also permitted medical care thanks to my son Doug. I leave now with more strength and gratitude to focus on soul journeys – yours, mine, and all immigrants who dare to change. Let’s keep in touch!!! Hooray!!! My frustrating search to pull my book into a tidy, compact bundle ends when I cut the Gordian Knot. That’s right, after working all night, with one stroke of the Send Key, I send the book ms. off to my publisher Summertime Publications. COUCH TO COUCH: Spiritual Travels on the French Huguenot Trail and I are now free to flourish. Why the Gordian Knot? What does that mean? A few weeks after I hit the Send Key, I phone my writing mentor Susan Tiberghien, director of the Geneva Writers Group. When I tell her my method to send the book ms. off . Susan says, “That’s great. You’ve cut the Gordian Knot , a perfect way to solve your problem.” Not ready to confess I know very little about this Greek myth, I agree. Online research however reveals the wonderful magic of her words. Alexander the Great, then 23 and as yet undefeated yet needing a strong omen to boost his goal to Conquer the World, arrived at the town of Gordium in Asia Minor. There in the Temple of Zeus Basiclica was an ox cart placed there one hundred years ago with its staves tied together in a complex knot in the center of which were the ends tied together hidden from view. The myth known also to Alexander was that whoever could untie the knot would conquer the East. To the East was the Kingdom of Persia, the wealthy center of the civilized world ruled by Darius III. Alexander sensed that Success in Gordium was the stuff from which Miracles would appear. Surrounded by his men and his seer, Alexander pondered the knot, tried to untie it and asked his seer if it mattered how he untied the knot. Receivng only the seer’s silence, Alexander then, with a single slash of his sword, cut the knot. Voila! 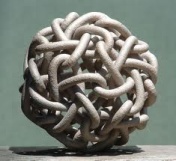 The Gordian knot becomes a metaphor for a radical solution to a complex problem. Violent thunderstorms that evening were interpreted by Alexander’s seer as an omen of Alexander’s future success in the East. The Rainbow in the photo East of Paris is taken by my friend Craig the day this post is written. Bloggers out there, has anyone else cut the Gordian-knot to solve a complex writing or personal problem? 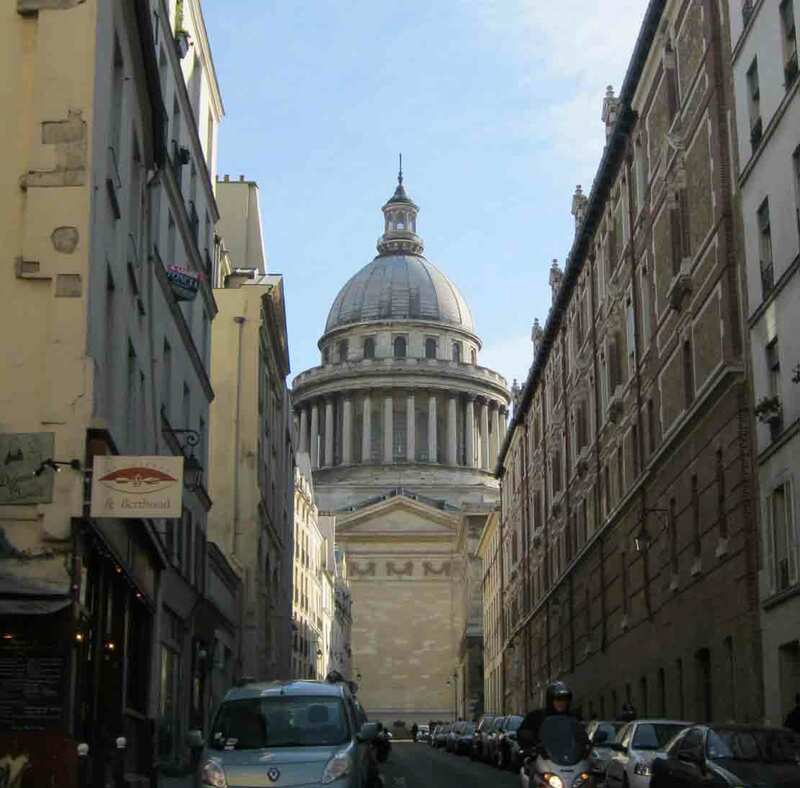 PARIS’ PANTHEON Rue Valette – Calvin hung out here!! Rhea, an 80 year old risk-taker, reveals her obstacle- defying journery across 17 countries and 5 continents. Please go to Rhea's Indiegogo campaign page to make a donation.